An article in the Minneapolis Tribune dated July 17, 1892, noted that Joseph Hamilton was putting up a three story building and construction was well under way. (By three stories they must have included the basement.) “The first story is to be fitted up for offices and the upper floor will be a large hall. ” The building and the Walker Building across the street made up what was called the “Brick Block,” in downtown St. Louis Park’s Walker Street (then called Broadway). There were originally three apartments on the second floor: two on the west side and one on the east. Throughout the center were the lodge halls for the Odd Fellows (Chesley and Charlie Hamilton were members), an organization that formed the same year the building was finished. It also hosted the Masons when that group formed in 1924. Mr. Shaft, the Trenkleys, Dr. German, the George Mignaults, the Hamiltons and the Williams family all took their turns occupying the various apartments. The east apartment was finally converted into more lodge space for the Oddfellows and Masons, who had been using most of the second floor. The first floor of the building had four sections, and businesses moved in and out. One of the earliest businesses in the Hamilton building was Trenkley’s Store, which E.M. Trenkley operated from about 1900. Trenkley apparently had a partner named Fischer for awhile. The store was bought in 1912 and Charles Hamilton took control of it some time after 1925. A quick look on Ancestry.com shows that Trenkley was born in Indiana on September 25, 1872. He and his wife Mathilda married in 1896. Clinton Arthur Trenkley, who was born in 1902 but died in St. Louis Park on July 23, 1903, might have been their child. 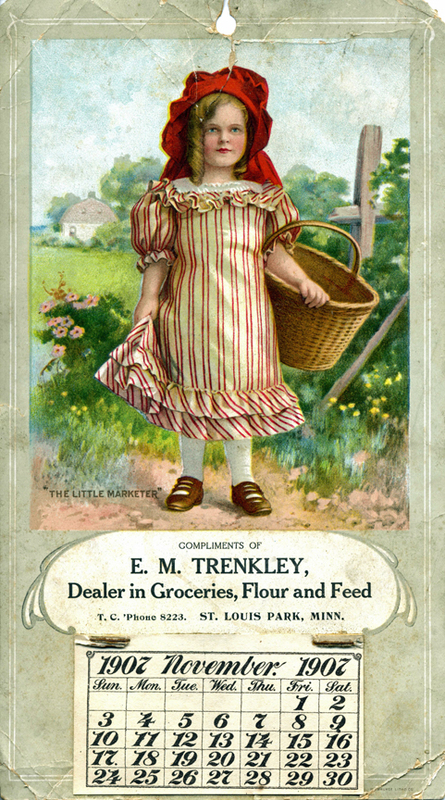 In 1900 and 1910, E.M. Trenkley was listed as a grocer, but he was bought out in 1912 and by 1917 he was working at the mortgage loan business. From 1920 on he lived in Minneapolis and worked on his own in real estate and as a mortgage broker. He died on June 6, 1946, in Hennepin County. Fred Mutchler donated this incredibly rare souvenir of Trenkley’s store from 1907. Charles Hamilton, one of the first occupants, opened a shoe store in the building right after its completion, and a few years later expanded into larger quarters. 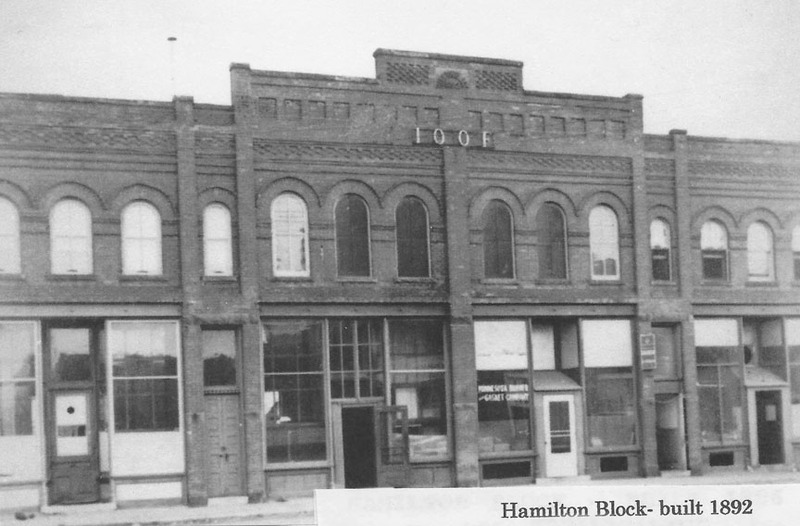 Some time later, Mr. Hamilton took over the post office, which formerly had been in the rear of the grocery store, then managed by Davis and Williams. Della Miller (now Mrs. Chas. Hamilton) was then the postmaster’s assistant, and of course when the change came about she moved into the new quarters also. She and Mr. Hamilton were married in 1902 and lived in the one apartment in the west section of the second floor. About 1912 the Hamiltons bought out Mr. Trenkley, who had originally run a grocery store in the building, and then later Hamilton’s added drygoods, therefore making the store quite complete. Mr. Hamilton continued business here until his death a few years ago, and since then his son Willard has taken over. 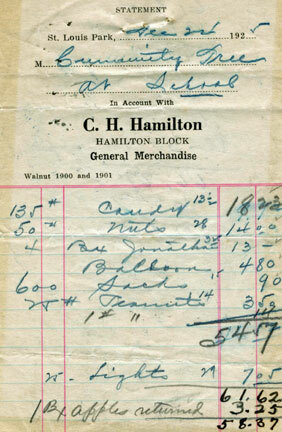 Hamilton Drygoods and Hardware Store discontinued business on November 1, 1942, due to Willard Hamilton having gone into defense work. 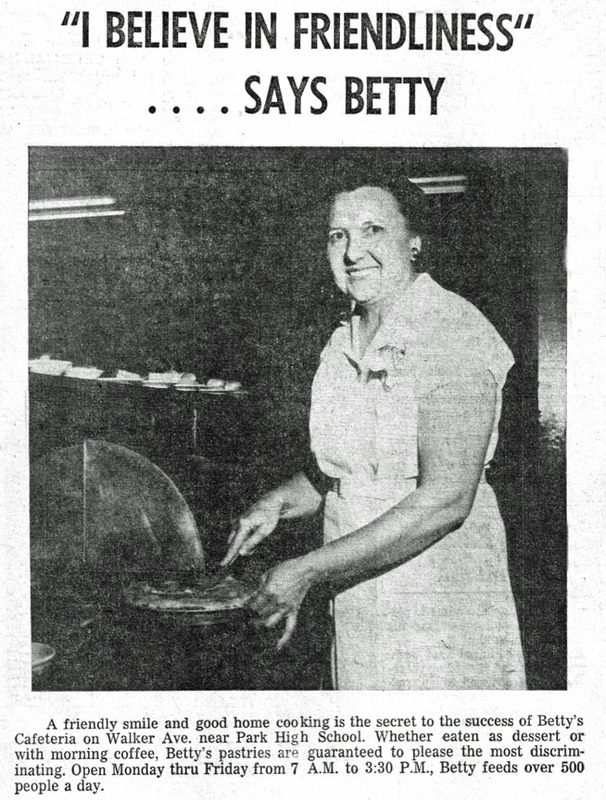 When Betty’s Cafeteria opened, or even Betty’s last name, is a mystery to us, but it was apparently a landmark for many years. The following was part of an ad campaign run in the Dispatch by Citizens State Bank when it opened in 1955. The St. Louis Park Pharmacy was listed at 6511 Walker Street in the 1933 directory. Around 1890 Doc Brown occupied a small space as a barber shop, before moving into the building across the street. In 1917 the Hamilton Building sustained extensive damage in a spectacular fire made worse by below zero temperatures and high snow. In October 1942 the Hamilton Building was sold to the Paul Revere Lodge No. 321, AFAM [Masons]. 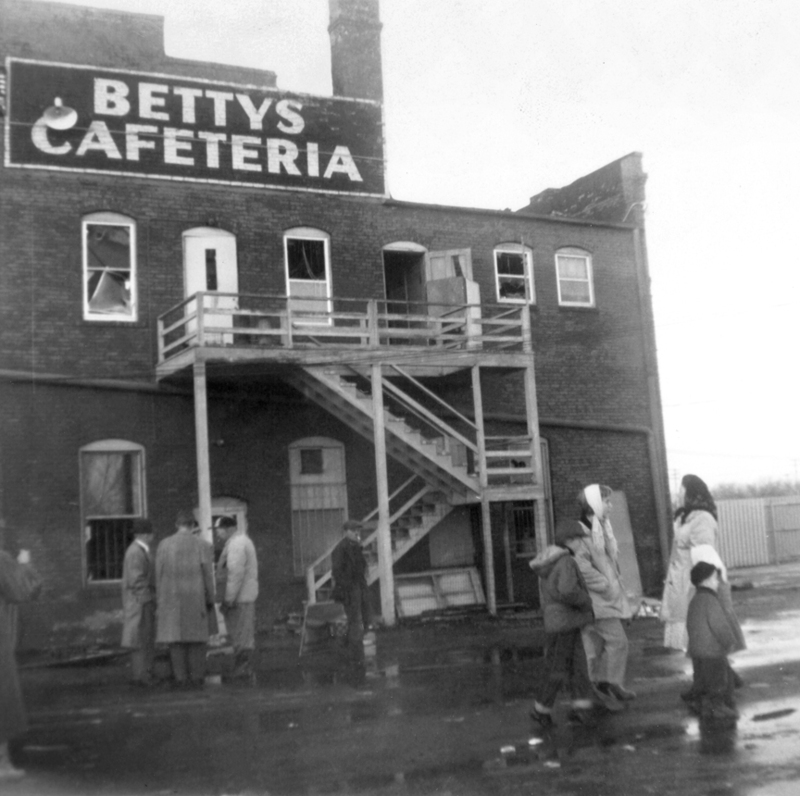 The Hamilton Building burned to the ground on December 25, 1958. 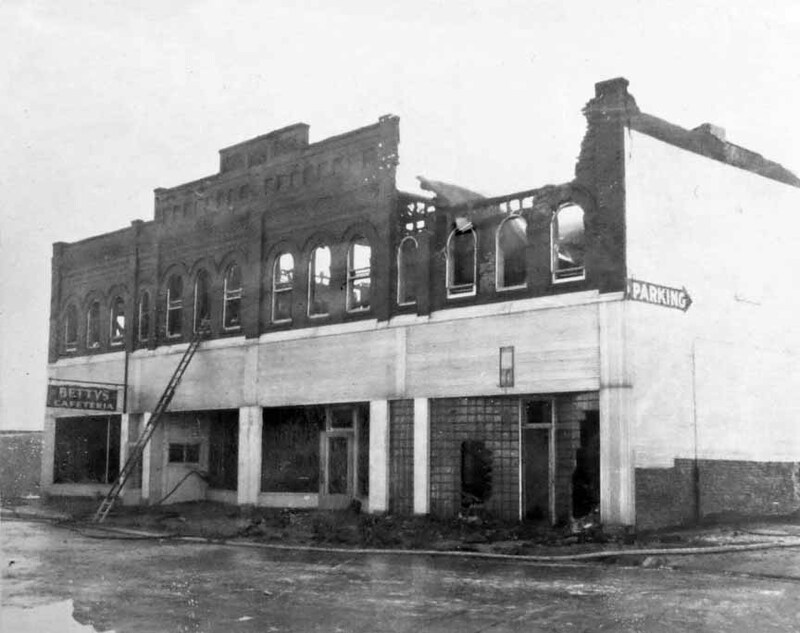 First spotted by a passing motorist, the blaze appeared at first to be mostly smoke and easily doused; at one point Worshipful Brother Virgil C. Hall opened the door to retrieve lodge records. But he and the firefighters were repelled by smoke and hot air, and the fire, which had spread through the walls and false ceilings, suddenly burst into an inferno such that flames jumped 30 feet high. Lars Johnson led the firefighting effort, which required the assistance of the Golden Valley, Hopkins, and Edina Fire Departments. 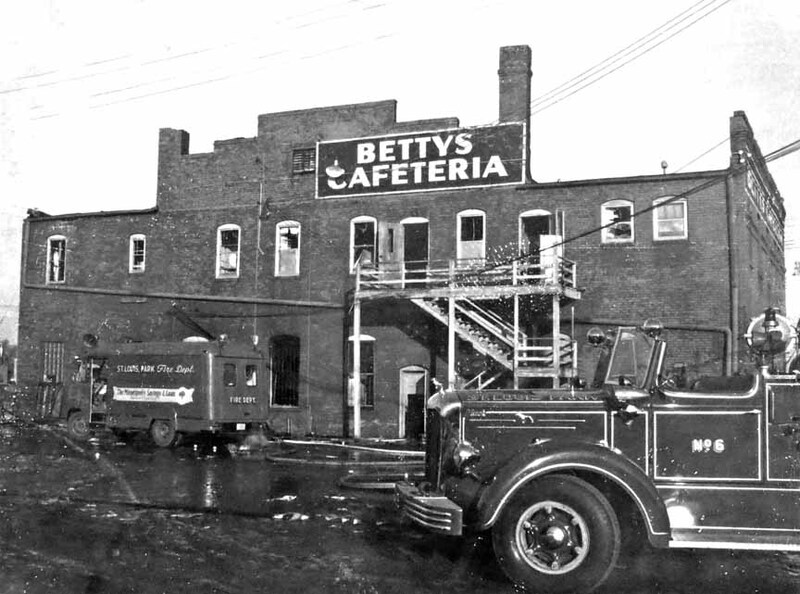 First floor tenants were Betty’s Cafeteria and the Storybook Photography Studio, run by a Mr. Hines; photographic chemicals were said to have fed the flames. Hundreds of spectators on nearby Highway 7 crowded the area despite the bitterly cold weather. The cause of the fire was never conclusively determined, but bad wiring or the ignition of photographic negatives were two possible causes. Another cause posited is that there was an organization in one of the basement offices that taught young mothers how to do household chores and a clothes dryer was left on. I was first aware that everything was not just right when I saw a rosy glow in the sky as I was driving home on Highway 7 that Christmas Day Evening. On getting closer, I realized that our Temple was engulfed in flames. What a sickening sight it was. We later learned that the first alarm had been turned in at 9:47 pm. Two minutes later, an engine arrived and made an immediate call for help. Two pumpers came from St. Louis Park, two from Hopkins and one from Edina. Hundreds gathered to watch the blaze. I remember seeing Harry Kaess digging in the street with his crew from the gas company trying to find the gas valve to shut off the supply to the building Several of the fire fighters were embers of Paul Revere Lodge and had some good ideas about where to direct the water in an effort to try to save records and equipment. The fire had been fought by 55 firemen, and between 500,000 and 700,000 gallons of water was estimated to have been hosed on the building. The next day several of us were able to get into the building to salvage what we could, Interestingly, the Lodge records were found to be only slightly damaged by water. Several members offered storage for the salvaged equipment. Bryn Mawr Lodge offered our Lodge space in their Temple. Robbinsdale offered space to Acacia Chapter and Bethel 41 and Albert Pike Lodge in Hopkins took n our DeMolay Chapter. So the answer to where to go was taken care of right away. Our building had been extensively damaged. The roof had burned off, the first floor had collapsed in many places, but the second floor held. The insurance companies judged the building to be a total loss. The Inspection Department of the City of St. Louis Park condemned it for further use and ordered it leveled for public safety. The Hamilton Building was replaced by the Paul Revere Masonic Lodge, built in 1960.